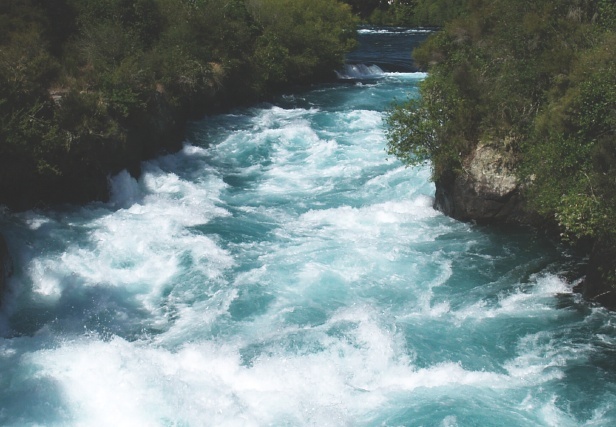 White water occurs in the upper course of the river when the gradient and obstacles disturb the flow of water, causing it to churn and create bubbles. These bubbles reflect back much of the light that hits them, making the water appear white. Whether a river flows smoothly often depends on its speed, and the steeper the riverbed, the faster the water will flow. The combination of fast-flowing water and obstacles like rocks causes the flow to become turbulent, with unpredictable variation in the speed and direction of the water. This creates a variety of features in the river. Where water doubles back on itself, pockets filled with bubbles open up; these provide much less buoyancy and feel like ‘holes’. Objects lodged in the river, like trees, can act as strainers, allowing water to pass through, but blocking the passage of larger debris. And in areas where the water moves rapidly, it wears away at the surface of rocks underneath, creating undercuts. The challenges of navigating the variable features of white-water rapids – whether they be jutting rocks, whirlpools or pressure waves – attract thousands of adrenalinejunkie kayakers and rafters every year.